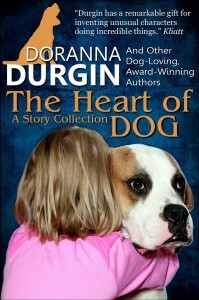 The Heart of Dog includes Doranna’s various backlist dog stories, and that’s all it was initially meant to include–until her dog-loving writer friends heard about her need to fund expensive veterinary treatment for her beloved young companion and dog sports partner, ConneryBeagle. In short order, the book filled out with nine more stories, all from wonderful authors. The stories encompass a range of genres and moods–plenty of humor, plenty of sweetness and satisfaction, and above all, a profound understanding of the Heart of Dog.